Green, Red, Blue Glass Necklace is a beautiful deep Multi coloured streaky stained glass oval, a piece of simple everyday jewelry. This necklace is handmade using glass and metal, the streaky oval shaped stained glass is copper foiled and then soldered with lead free solder. 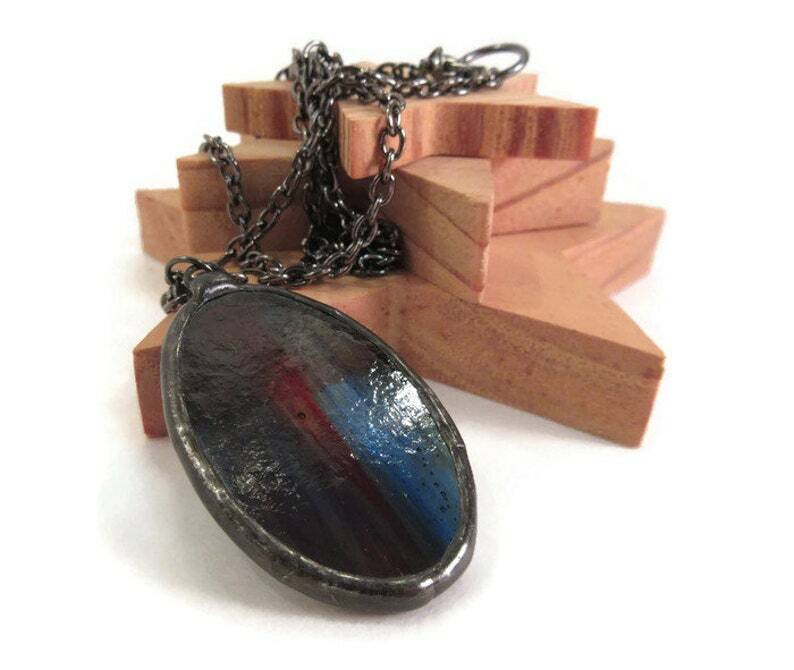 The piece was given a dark pewter like patina and waxed to a shine. It has been hung on a 22 inch chain with a lobster clasp. This Streaky oval glass pendant comes packaged in a handmade fleece gift bag that is ready for gift giving or safe keeping. Gorgeous. Unique and well made. Love this shop. Beautiful handmade pieces. Proud to wear. Proud to gift. These are lovely earrings (Dragonfly wing drop earrings) - couldn't have been happier. They are exactly what I ordered and arrived ahead of time and packaged to prohibit damage. Thanks! I will try my best to have happy customers and any problems can be discussed and hopefully resolved. Any pieces that are received broken or damaged I ask for a photo of the piece with the packaging so I can correct any packaging errors. Your business is important to me. All items shipped via Canada post reg parcel ....items shipped within Canada that request insurance must add 1.00 . I can not be responsible for any customs charges that occur within your given country. Please be aware of your countries customs policy. Any shipping upgrades will be paid by the customer unless a prior agreement has been struck between both parties. Each pendant comes packaged in a little fleece bag, which I hand sew myself. This little buffer bag is an excellent way to shine your stained glass pendant or jewelry and also protects it before and after its shipped to you. For Pendants that are pictured without a chain I will include a long piece of thick black cording to hang your pendant.